In a blatant act of anti-Semitism the San Francisco-headquartered company Airbnb has targeted Jews living in Judea and Samaria with a boycott. They have joined the Boycott, Divestment, Sanction (BDS) Movement against Israeli Jews. The former Ambassador to the United States, Michael Oren stated in a recent Twitter post: "Airbnb blacklists Jewish apartments in Judea and Samaria - not Palestinian apartments, not apartments in Turkish occupied Cyprus, in Moroccan occupied Sahara, not in Tibet or the Crimea." This comes in the same week over 500 missiles were fired from Gaza at Jewish homes, schools, hospitals and businesses. Whether it is terrorism or boycotts, media bias or by any other method this is rooted in hatred of the Jews. Anti-Semitism often masquerades as sympathy for the Palestinian people, yet those who hold such views ignore the stated intentions of both Fatah and Hamas, the two main Palestinian political parties. Their charters still call for all Jews to be removed permanently from the Holy Land. If there is no room for Jewish people in the land in which they have dwelt for over three-thousand-years then where on this planet may they live? Airbnb’s decision to target Jewish Israelis is in effect, economic warfare. I will not be doing business with Airbnb, a great company that has chosen to allow hatred to guide their choices. The State of Israel must constantly face choices that most nations never even consider. One of the big battles America now faces is whether protecting its borders is a moral thing to do but in the State of Israel this issue is front and center and always has been. Like any sovereign nation, Israel has a right and a duty to protect its citizens within its territory but Israel must contend with constant attempts by the United Nations to redefine its borders while simultaneously defending them against terrorist attempts to penetrate them. And when the Israelis respond to terrorists attempting to sneak across their borders or when they storm the fences as bomb-throwing rioters, the Israelis’ actions are routinely cast as moral failures while the protestors are cast as the downtrodden who are acting based on their moral rights. Of course they do have human rights, but Israeli soldiers have to make split second decisions on how to respond; many of whom are aged 18 to 20. The international media generally demonstrates only passing interest in the obvious connections between the protests and simultaneous acts of terrorism. The Israelis are generally characterized as heartless defenders of questionable borders while the rioters and terrorists are presented as people who just want to live normal lives, their rage being constantly justified by an outrageously warped idea of journalistic fairness. This type of unsymmetrical media reporting seems more driven by ideology than an interest in reporting facts. Unbalanced reporting from the media almost always leads to greater conflict. Having just written the bulk of this blog post I saw a news report from last night in which Basem Naim, a senior Hamas official stated: “The protests will continue” and “we are moving toward the next escalation”, openly admitting that HAMAS, along with other groups is organizing the protests. Hamas, its charity branches and military wing, have been on the terrorist lists of many Western countries including the United States since 1997, a designation they have repeatedly earned by their actions. HAMAS (Supported by Iran) to the southeast in Gaza, Hezbollah (Supported by Iran) to the north in Lebanon, the Syrian war to the northeast (Supported by Iran), Islamic radicals intruding from the south in Egypt’s Sinai Peninsula (Supported by Iran) and terrorist attacks within from the PLO with Iran supporting each terrorist front. Such is the insanity on Israel’s borders. Please pray for truth to prevail, for fair and honest reporting and for these conflicts along the Israeli/Gaza border to be resolved. And as always, pray for the peace of Jerusalem. WHY IS VIOLENT HATRED REWARDED? “This is so discouraging...How can anyone look at our situation with the Arabs and say: "everyone is playing nice" and "we should preserve the status quo". Just because there have been fewer successful terror attacks does not mean that there is a decline in attempted attacks. We are living among those who have sworn to annihilate us. The Palestinians continue to indoctrinate their youth towards violence and the PA continues encourage terrorism by paying the families of murders. The status quo is this: the Arabs are stealing land and building all around us illegally while we have instituted a building freeze. We do not have authority of our most holy site and we sit idly by as our antiquities are pillaged and trashed. The status quo is not peace; it is holding our breath waiting for the next attack. We awoke this morning to the news that a mass shooting has taken place in Orlando, Florida. At this time, it is not clear whether this is another Islamic Terror attack, but, according to the police, “there are indications” that it could be. Let’s face it; even if it is not this time, we know they are coming. These Islamic Terror attacks against America began in earnest on `August 7, 1998, when over 200 people were killed in simultaneous explosions in two cities, one at the U.S. Embassy in Nairobi, Kenya and the other at the U.S. Embassy in Dar es Salaam, Tanzania. Those attacks were linked to local members of the Egyptian Islamic Jihad. My family had an early introduction to this brand of hatred. Our oldest son’s best friend lost his father in the year 2000, when United States Navy guided-missile destroyer USS Cole was bombed while being refueled in the Yemeni port of Aden. 17 American sailors were killed, and 39 were injured. Al-Qaeda claimed responsibility. It wasn’t until 9/11 that we really began to understand how broad and serious this threat truly is. I am a Floridian. This mass shooting in a nightclub is likely to be added to the list of Islamic Terrorist incidents we have either actually experienced or narrowly avoided here in the Sunshine State. But we are not alone. There have been six confirmed Islamic Terror attacks carried out since 9/11 on U.S. soil. There have also been many unsuccessful attacks by radical Islamists in the same time period including the “Shoe-Bomber” on American Airlines Flight 63 from Paris to Miami, a 2010 attempt to set off and explosive device in Times Square and an attempted mass shooting in Garland Texas last year to name a few. I do not point these things out to frighten anyone; I only do so as a warning that there is a strategic war being waged by Islamic Radicals around the world that is real and growing. It should be obvious by now that it is not as the media has constantly defined the problem; that the Middle East core issue is Israel’s existence or its “occupation”. It is no longer “over there”. The issue is not Israel; it is hatred of all things non-Islamic by its most radical adherents. And now, it is here. As I departed from Tel Aviv Airport just this week there was an Islamic Terror attack in a mall just a few miles away where four Israeli citizens were murdered and many others injured. Many will portray this terror against innocent, unarmed shoppers as justifiable retribution for the “Israeli occupiers”. It has been reported as if these are freedom fighters or just crazies. These are not freedom fighters…they are Radical Islamist armed by Iran and influenced by the likes of ISIS, Al Qaida, Boko Haram and the Talban. The concept that these extremists are simply attempting to help the Palestinians to have land they control where a normal society can flourish is a lie that the worldwide media has helped to develop and perpetrate. Their intentions are clear: “push Israel into the sea”, “death to Israel”, ”death to America” and a worldwide caliphate where non-Muslims are treated as infidels and sharia law is practiced by everyone or forced upon non-believers. Ideology is what drives these actions. The frontline in this war is in the Middle East. For a long time, Israel was the primary target, but now, even non-radicalized Muslims are murdered unmercifully as infidels along with Christians, secularists and everyone else who do not follow their brand of Islam. A determined and united force of resistance can isolate and manage this war as has been done throughout history, but the only final answer is for their hearts to be changed. Only with God’s rescuing hand will we turn this tide. So please pray for His help for all people, pray for the leaders of our nations, pray for spiritual awakening in the hearts of men, women and children around the world, and above all, pray for the peace of Jerusalem. Blindfold Games are quite comical and entertaining. Whether it is a children’s game at a party or a team-building exercise at a corporate meeting, blindfolds are used to enhance our other methods of perception. But in the end, there is always an appropriate moment to remove the blindfold and open your eyes. This is such a moment. When a person straps on a suicide vest, they intend to die. When they fire upon innocent victims, they do not want to make a statement, they want to eliminate all voices but their own. The primary voices of extremist Islamists are not faint, they have screamed aloud as it flew airplanes filled with terrorized passengers into the Twin Towers. Their voices were not muffled as they fired upon allied soldiers present to help them build a future. The ideological worldview that invoked the bombing of a Russian airliner in Egypt, the murder of Christians, Jews and fellow Muslims throughout the Middle East and the gruesome attack in Paris will not go away when the news stories fade. But we are not without recourse. We are called upon by Scripture to pray for our governmental leaders. It has been quite a while since I blogged on this site. Mostly I have posted small items of interest on Facebook, but recent events in Israel, especially those in Jerusalem, demand more than snippets of information. If you do not read the entire piece, please read the final section entitled, “RAY OF HOPE”. Having just returned from the Holy Land in the last 24 hours adds additional poignancy to this article. These are the “happy holidays” of Sukkot (Feast of Tabernacles). Sukkot is a time of great happiness for Jews everywhere, but especially when celebrated in Jerusalem. I was in Jerusalem as part of our Israel Allies Foundation's “Chairman’s Conference” held yearly during Feast of Tabernacles. In partnership with the International Christian Embassy Jerusalem and the World Jewish Congress, we bring parliamentarian representatives from around the world for three days of education, dialogue and deliberation. This year, as always, a declaration was developed and signed by our attending parliamentarians, presented to Israeli Government leaders and taken back to the represented parliaments for action. This year's resolution was a powerful statement against BDS (Boycott, Divestment & Sanction-BDS is a global campaign attempting to increase economic and political pressure on Israel to comply with the stated goals of the anti-Israel movement). As I stated earlier, this is the “Happy Holiday” for adherents of Judaism and those who join with them. But instead of happy hearts, singing and dancing in the streets and the smells of holiday meals, there is painful concern. Just this weekend, two terror attacks put the spotlight on growing violence against innocent holiday celebrants. The family attacked in this horrific incident lived in Neria, north of Ramallah. They leave behind six orphaned children, four of whom – aged 4 months, 4, 7 and 9 years-old, were in the vehicle at the time of the attack. Afterwards, the news of Israelis killed was cause for celebrations in Palestinian neighborhoods across the region, even in Jerusalem. Though I am sure many Palestinians silently sorrowed at the violence, crowds of adults and children alike shot off fireworks and sang in the streets. 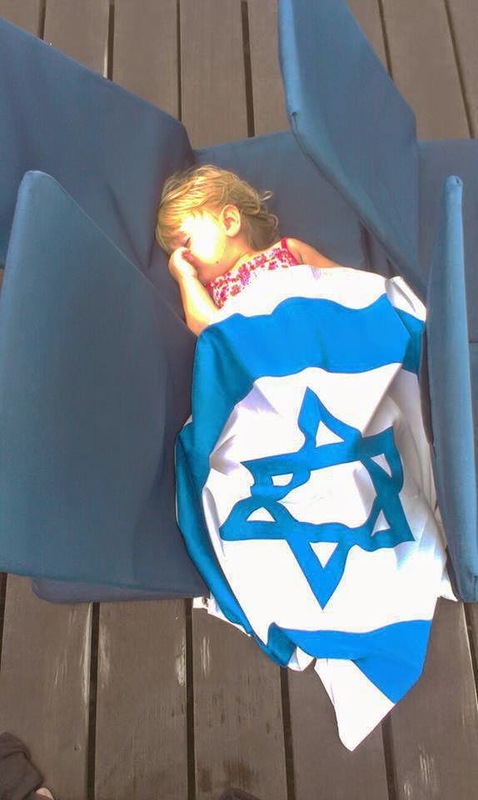 In Sukkahs both in Israel and around the world there were quiet prayers, perplexed angst and deep sorrow for this loss of life; the normal happiness of the holiday was tainted with anguish. But there is more. Yesterday, just as Shabbat was ending, two more Israelis were stabbed to death. The first incident occurred close to the Lion’s Gate in the Old City section of Jerusalem. Aharon Bennett a 21 year-old father visiting Jerusalem with his wife, two-year-old son and baby daughter, was stabbed to death. They were headed to the Western wall for prayer when they were attacked by a 19 year-old Palestinian. The second victim was Rabbi Nechamia Lavi, 41, a rabbi at the Ateret Cohanim Yeshiva in the Old City and a father of seven. He too, was killed trying to defend Mr. Bennett’s family. Mr. Bennett's wife was seriously wounded, while their son suffered minor injuries and their baby was unharmed. Just a few hours later, another stabbing took place near where the first attack occurred. In this attack, a 15 year-old Israeli teenager was stabbed by another assailant who is also believed to be a Palestinian terrorist. The teenager was sent to the hospital with wounds to the chest and back. He is expected to recover. These attacks underscore the rising hatred and violence we see against Jewish people in Israel and around the world. But let me be clear, it is a rising tide of hatred of “People of the Book”, the phrase used by Islamic Fundamentalists to describe Jews and Christians alike. When added to the rising tide of hatred of all things religious, as demonstrated this week in Oregon, it is a clarion call for us to pray as never before. The same hatred connects these two incidents that occurred hemispheres apart. Hatred, whether anti-Semitic or anti-religious, has no bounds. Now is the time for people of faith to stand together. You likely remember the three Israeli teenagers kidnapped and killed in June of 2014. This event made worldwide headlines as the Israeli government furiously searched for them for 18 days, only to discover they had been killed the very same day they disappeared. One of the teenage boys was 16 year-old Gilad Shaer (also spelled Gil-ad Shaar). Last week, I sat in the shade of a private sukkah in the Judean/Samarian region listening to Gilad’s mother and father speak about their tragic journey. Two young girls, two of their five remaining children, stood to the side as they spoke of their murdered son, their pain and their hopes for the future. They told of us Gilad’s love for Torah, music and adventure. They talked bout how his loss has impacted so many, especially his younger siblings. They talked about the overwhelming support and love expressed to them from around the world. They talked about their desire to live in the Land in peace. It was very poignant, inspirational and heartrending. However, what struck me most is what they did NOT talk about. They did not talk about Gilad’s murderers. They did not talk about the Israeli-Palestinian Conflict. They did not talk about hatred for anyone. They talked about life. They talked about humble courage and hope for the future. This is not a time for people of faith to cower and fear. As with the Shaer family, it is not a time for our own version of circumstantially justified hatred or violence. It is instead, a time for us to give a voice to the martyrs and call upon spiritual, secular and governmental leaders everywhere to stand against this rising tide of hatred and violence. Jerusalem is a moral test for the world. How we deal with it will either invite the blessing of God upon our lives, nations and world or bring the consequences of His judgment. Please pray for the Shaer family, the families who have just this week suffered so great a loss and for all families who have lost loved ones to religious hatred, whether in Israel, Oregon or anywhere else. And, as always, pray for the peace of Jerusalem. It breaks my heart to hear that Jewish Israelis committed a terror attack against Palestinians today. A Palestinian toddler was killed and three members of his family injured in a deadly arson attack on their home by suspected Jewish, far-right extremists. The former ambassador to the U.S., and current Knesset Member Michael Oren stated earlier today: "The hate crime in Duma was an act of terror, The state of Israel is a country of law and works accordingly against anything that goes against our beliefs." This act of terror will play into the hands of those who hate and vilify Israel. Shame on those who perpetrated this crime or support it in any way. Jews in Israel are rightly frustrated by the constant Palestinian extremist attacks on their families, friends and citizens. However, to turn to the same evil tactics lowers the value of human life and is directly opposed to Jewish faith. The Jewish Nation is a political state, but above all it is Jewish in character. No army in the world is more careful than the Israeli Defense Force (IDF) to protect non-combatants from collateral damage. No nation gives medical care to more of those who call for its destruction than Israel. This terrorist attack, committed by far-right Israelis, is the antithesis of the Jewish State I know and love. Please pray for the surviving Palestinian family members. Pray for a softening of the heart for the far-right Israelis. And as always, pray for the peace of Jerusalem. No part of this material may be reproduced , stored or in a retrieval system, or transmitted in any form or by any means- electronic mechanical, photocopying, recording or otherwise- without the prior permission in writing from the author.